Today, I thought it would be interesting to talk about something a little different... Tea! Yes, tea is one of those topics that I could go on about for hours and hours. As mentioned in last week's Versatile Blogger Award tag, I'm a complete tea addict! I drink tea throughout the day not just because it's tasty - it's also a healthy way of keeping hydrated, and a great source of antioxidants. These help reinforce the body's natural defence system, and slow down the ageing process. Today's post will be all about my favourites; but I'm always on the lookout for new types of tea to try, so please let me know if you have any recommendations! Womankind - cranberry, rose and sweet vanilla. This a typical fruity tea - naturally sweet; very light and easy to drink. It smells absolutely divine, and I enjoy it especially in the summer because it is so refreshing. Relax - chamomile, fennel and marshmallow root. Delicious, delicate and soothing - this tea always helps me unwind after a busy work day. Love - rose, chamomile and lavender. Admittedly, I bought this one mostly because of the cute packaging. It's quite similar to Womankind but less fruity, more herbal and delicate. Detox - aniseed, fennel and cardamom. This is probably my least favourite Pukka tea in terms of flavour, but it really helps if you're on a detox diet. I drink this whenever I'm in a need of a little metabolism boost (it really works!). Green tea with prickly pear & marigold flower. Delicious green tea with a twist. The marigold flower tastes very unusual - it's sweet, flowery, and almost 'grassy'. I reach for this one whenever I'm in a mood for something a little different. Flavoured fruit tea with plum and cinnamon. This is one of the most intense fruity teas I've ever tried. It's rare that you get such good quality from a teabag, especially considering the low price. This is refreshing, sweet, and with a nice, spicy twist. Warming tea with orange, cinnamon & cloves. This is my perfect winter tea - fruity, sweet, gently spiced and with a hint of cinnamon. 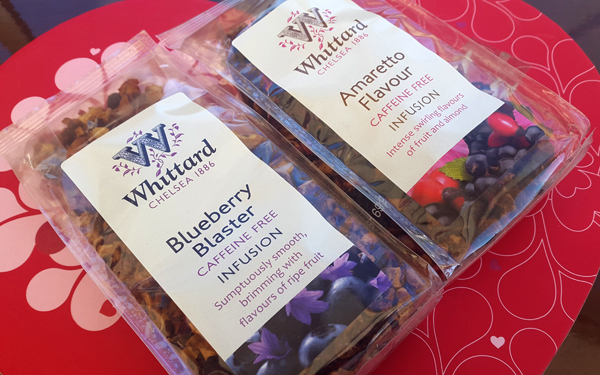 Whittard is one of the most established British tea brands, and their loose leaf tea infusions are some of the best I've ever tried. I'm currently loving their Blueberry Blaster and Amaretto Flavour blends. Both of these are caffeine free, and they taste really intense and delicious. The quality of the Whittard teas is always top shelf - their blends include real pieces of dried fruits, nuts and herbs. Blueberry Blaster is a must-try for anyone who enjoys fruity teas; whereas Amaretto is more nutty, fruity and less sweet. I find that some of the more intense fruity teas tend to taste a little sour and 'acidic', but Whittard always gets it right. 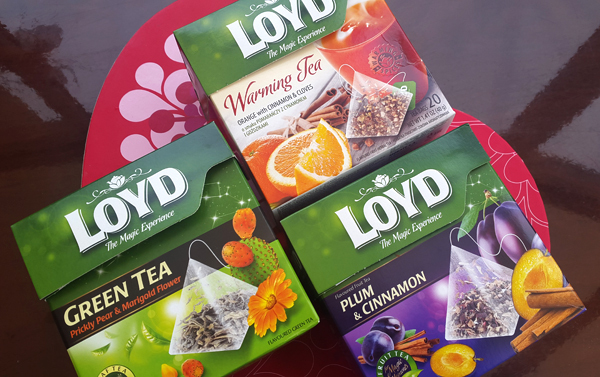 These are a little more pricey than your standard supermarket teas, but you can usually find them on sale (I purchased mine for just three pounds per 125g of loose leaf tea). This little blend by Abbey Botanicals is my miracle tea. Chamomile works wonders for me, and I recommend it to anyone who suffers from anxiety or stress - it will really help you unwind and relax. Chamomile tea also helps to clear up skin irritations (such as acne) and promotes healthy sleep, so you really can't go wrong with it! On top of that, it tastes really delicious, sweet and soothing. I personally think that chamomile tastes lovely when mixed with other flavours, and I recommend trying it with a teaspoon of honey, or a splash of almond milk. 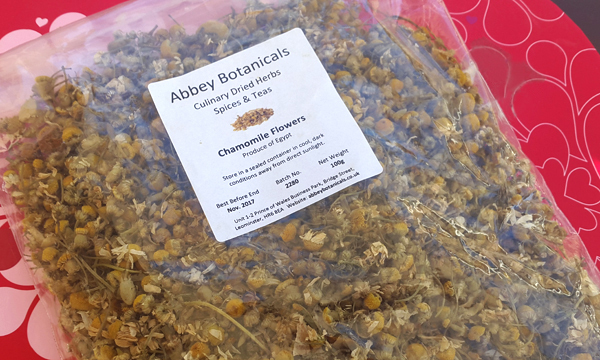 Abbey Botanicals offer many other interesting teas, such as raspberry leaf, peppermint and hibiscus flower. You can purchase these on Amazon for two to five pounds. Omg , the mugs a re super cute, i have taken green tea for the past few weeks now so i think i'll have to try this one with Marigold Flower , i'm sure it will taste good , I'm into tea as well so always excited when the come in different flavours. Great post. I like chamomile tea too! It's so relaxing. I like to drink it with vanilla but it never came to my mind to add almond milk to it. Although I extremely rarely drink tea with milk, I'd like to try it out. I guess it will taste very good. :) The mugs are very lovely! That Whittard tea looks amazing! I go through stages with tea. There are times when that's the only thing I'll drink in the morning or at night and then I'll go back to just drinking coffee in the mornings. But that tea, has my attention! I have to see if they sell them here in the states. Thanks for sharing, beautiful, and I hope you have an amazing day! love this post cause i LOVE tea! I love tea! I haven't tried these brands, I don't think they're available here. I don't like the taste of normal tea, I am going to try some flavoured ones instead of drinking mochas all the time! I love your mugs! They are so cute! They look so nice! I love green tea, or raspberry and mango, or liquorice, or this one called sweet dreams. Plus you can't beat a mug of good ol' PG Tips! I am a real tea lover, and I love whittard, their teas are delicious! Okay, I'll be honest and say I don't drink too much tea and know these brands at all because I'm more of a coffee drinker, but these sound great! 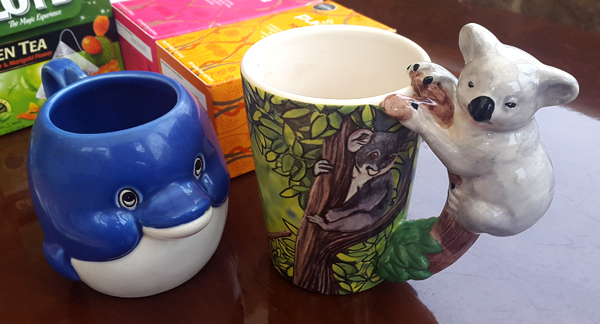 Your mugs are absolutely adorable! Tea is my favorite! I drink green tea on the daily! I'm more of a chai drinker - I like the flavor, and it doesn't stain like coffee or tea! Pukka sounds great though, I wonder if they have them in the US. oooh i love tea too! thanks for sharing! I am a big tea drinker, but I tend to go with green or white tea as opposed to fruit tea. I love drinking tea, plus it is so beneficial :) I love Pukka, but I think that Whittard is my fave! Great post! Would your like to follow each other? i like so much tea ! I must try from this tea . Ooo may need to check some of these out! I am starting to get more into tea so I'm always looking for new ones! Not boring at all! Green tea is my favourite, I love it! =) I love mixing it with other flavours, though, fruity green tea is especially yummy =) x Thank you for stopping by! Omg! I love tea in the fall! Thank you so much for this post. I am now a follower of yours. I hope you would take a look at my blog as well. Pukka sounds like the way to go. I recently bought this super expensive tea and it turned out to taste like cardboard. Too bad I didn't know about these brands! I love tea so much!! Love your tea mugs!! Oh the tea looks so delicious! I love it the tea! Those teas sound so amazing! I always usually gravitate toward a lemon and ginger blend. Great post! So many teas to try!